The Volusia series motorcycles from Suzuki are reserved for riders who know where they're going and how they're getting there, and the Volusia 800 is no different. 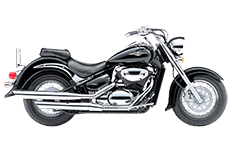 Outfitting a Suzuki with the right saddlebags sometimes takes a bit of patience and luck, but we've got a full lineup of Viking Bags designed specifically to mount to your bike. Simply click on a model in this section to learn more, or give us a call today if you have any questions or concerns. To better help you make a decision for your motorcycle, we sell all of our saddlebags with a 30-day money back guarantee. Take the free mounting hardware (a $100 value) and installation instructions that are included with the bag and install on your bike. Test them out, get a feel for how great they can make your bike and let us know what you think. Your satisfaction is one of our highest priorities!